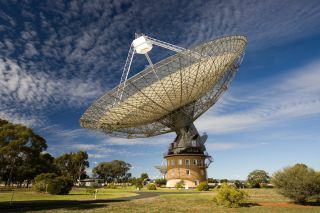 The Parkes radio telescope in Australia is the third telescope to begin searching for signs of intelligent alien life as part of the $100 million Breakthrough Listen project. A $100 million search for intelligent alien life just added a big arrow to its quiver. Breakthrough Listen has begun using the Parkes radio telescope in Australia to scan the heavens, representatives of the ambitious, decade-long project announced Monday (Nov. 7). "The addition of Parkes is an important milestone," billionaire entrepreneur Yuri Milner, founder of the Breakthrough Initiatives, which include Breakthrough Listen, said in a statement. "These major instruments are the ears of planet Earth, and now they are listening for signs of other civilizations." The first Breakthrough Listen observations for the Parkes dish came Monday, when scientists turned the telescope toward the Proxima Centauri star system to look for possible signals from alien civilizations. Proxima Centauri is the closest star to the sun, lying just 4.2 light-years away from Earth's star. This past August, astronomers announced the discovery of an Earth-size planet orbiting in Proxima Centauri's "habitable zone," the just-right range of distances where liquid water could exist on a world's surface. It's therefore possible that the planet, known as Proxima b, may be capable of supporting life as we know it, scientists have said. "The chances of any particular planet hosting intelligent life-forms are probably minuscule," Andrew Siemion, director of the University of California, Berkeley's SETI (Search for Extraterrestrial Intelligence) Research Center, said in the same statement. "But once we knew there was a planet right next door, we had to ask the question, and it was a fitting first observation for Parkes," Siemion added. "To find a civilization just 4.2 light-years away would change everything." Proxima Centauri is also the target of Breakthrough Starshot, a Breakthrough Initiatives effort that aims to blast tiny, sail-equipped "nanoprobes" toward the system at 20 percent the speed of light using powerful lasers. Milner and a group of researchers, including famed cosmologist Stephen Hawking, announced Breakthrough Listen in July 2015. Over the next 10 years, the $100 million endeavor aims to search the 1 million stars closest to the sun, as well as the 100 nearest galaxies to the Milky Way, for possible SETI signals. The 210-foot-wide (64 meters) Parkes dish, which is operated by Australia's Commonwealth Scientific and Industrial Research Organization (CSIRO), lies near the town of Parkes, in the state of New South Wales. The radio telescope famously helped relay live video of the Apollo 11 moon landing back to Earth in July 1969, a role featured in the 2000 film "The Dish." Breakthrough Listen representatives also announced last month that the project would be teaming up with China's new Five-hundred-meter Aperture Spherical radio Telescope (FAST) — the world's largest radio telescope — to coordinate SETI observations.